From left are Council members Jon Stehle, Janice Miller and Jeff Greenfield, Mayor David Meyer and Council members Ellie Schmidt, Michael DeMarco and Dan Drummond. Photo by Bonnie Hobbs. 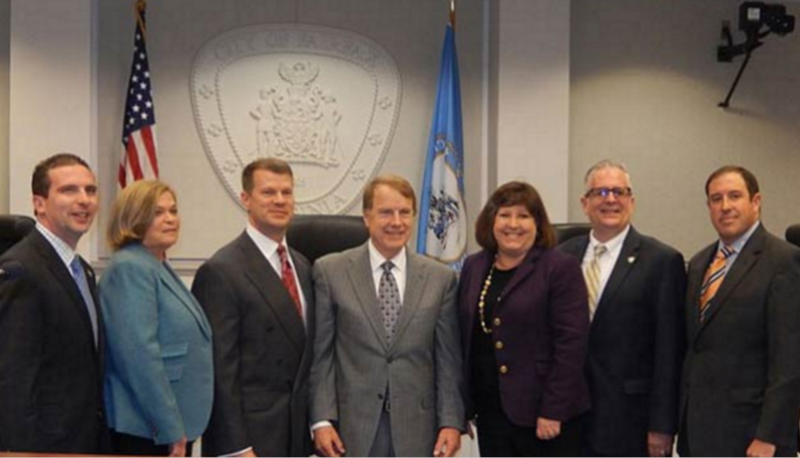 The City of Fairfax has a council/manager form of government. The mayor and six councilmembers are elected every two years on an at-large, non-partisan basis. The current term expires 6/30/2018. The City Council is an elected public body that typically meets the first Tuesday of the month for work session to discuss issues and develop consensus; however, no formal action may be taken. Work sessions are held in the Work Session Room located in Room 111 of the City Hall Annex. The City Council typically meets the second and fourth Tuesdays of the month for regular meetings for public hearings and action items and to allow for public comment. Council meetings begin at 7 p.m. and are held in Council Chambers located in Room 100 of the City Hall Annex, 10455 Armstrong Street. The City Council conducts no meetings during the month of August and additional meetings may be called as necessary. A city resident since 1981, he has actively supported the Appalachia Service Project and the Fairfax Police Youth Club. He is a member of Fairfax United Methodist Church. Meyer also is a Trustee of Randolph-Macon College. Michael J. DeMarco is serving his third term on City Council. A member of the 1993 Bond Referendum Task Force, Greenfield also served as the vice chair of the Fairfax 2020 Commission and was a member of that committee’s Economic Development Subcommittee. He served as vice chair of the city’s Park and Recreation Advisory Board and was vice-chair of the city’s Task Force for a More Livable City of Fairfax. Eleanor D. Schmidt is serving her fourth term on City Council. She represents the city on regional boards including the Virginia Municipal League Finance Committee. Schmidt has served on the board of directors of Historic Fairfax City, Inc., as chair of the Independence Day Celebration Committee and in various positions on the Industrial Development Authority, City of Fairfax 2020 Commission, Festival of Lights and Carols Committee and Chocolate Lovers Festival Committee. She also served as the color commentator of the Independence Day Celebration Committee. Jon R. Stehle, Jr., is serving his first term on City Council. Stehle, a city resident since 2007, has chaired the city’s Parks and Recreation Advisory Board. He also served on the Green Acres Feasibility Study Committee and City of Fairfax Branding Advisory Committee. The Oxford Row resident, who served as president of the Oxford Row Civic Association, is a strategic performance management lead with a federally funded research and development center. As a senior analyst with the U.S. Government Accountability Office (GAO), he received a GAO Meritorious Service Award in 2013.